The American Idol contestants sang Dolly Parton on last night’s performance night. 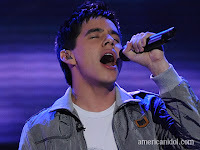 David Archuleta and Carly Smithson’s performances are the best for the night. Ramiele Malubay performance is still disappointing. I have been waiting for her to do something special but she’s still not in that zone. I know I’m a Filipino and I should support her, but it’s a singing contest. The biggest surprise for me last night was to learn how brilliant Dolly Parton is. She’s a brilliant songwriter and has over 3,000 songs. She even wrote Whitney Houston’s “I Will Always Love You.” Isn’t that surprising. I really thought her songs were rubbish but I was wrong. Who should be on the bottom three based on last night’s performance? Ramiele Malubay, Kristy Lee Cook and Jason Castro. America should give a chance to Syesha Mercado. She doesn’t deserve another bottom three. Picture courtesy of American Idol. Ramielle has a talent and I like her voice but she could have done a better job sa pagpili ng kanta. :( Sayang... pero she's a cutie and a sweet gal though. I'm sure she'll be fine. Oo nga pla- blog hopping from filipinobloggers. ah so that is why her last time sounds so pinoy.. pinoy pala s Malubay..